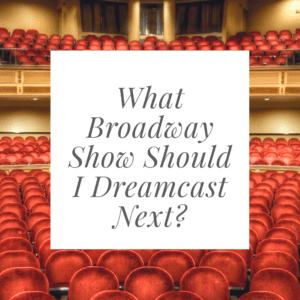 What Broadway Show Should I Dreamcast Next? I’ve been thinking I’d like to do another musical dreamcast (for a project that will never be made except in my dreams). When I do dreamcasts, I take a preexisting movie, stage show, or idea, and put in the Broadway actors and actresses that I think would be perfect in the lead roles. I have a few ideas for my next one, and that is where you come in. Should it be…? Downton Abbey: The Musical – Just think, I can talk all about how Angela Lansbury would be the perfect Dowager Countess. The Devil Wears Prada: The Musical – To get everyone psyched about the upcoming Elton John musical. Harry Potter: The Musical – I really just want the opportunity to talk about Harry Potter (I did this on an essay I wrote in high school as well, still got a 99). The Help: The Musical – Because I really want a happy, female-centric musical on Broadway, to add to the lovely ones already there. Z: The Musical – Who doesn’t want to see a musical about Zelda and Scott Fitzgerald? Or should I do something else? What do you think? Oh my gosh, is there going to be a for real The Devil Wears Prada musical?! You have made my week with that information! 👐 I vote for The Devil Wears Prada: The Musical! Yes! They announced it a few months ago. Written by Elton John. I am so EXCITED. The Help is one of my all time favourite books/films!! That would make an incredible musical!!! Right? I’d LOVE to see that.